EXCLUSIVE! 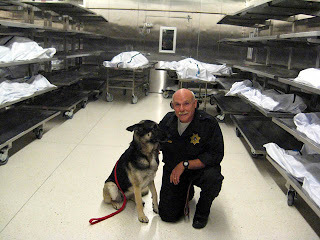 Cbad Shelter Pup Now "Detective LuLu"
Before becoming San Diego County Medical Examiner in 2003 Dr. Glenn Wagner served as director of the Armed Forces Institute of Pathology in Washington, D.C. where he participated in some of the nation’s most historic crime scene investigations – from the 1983 bombing of the U.S. Marine barracks in Beirut to the crash of American Airlines flight 77 into the Pentagon on 9/11. Dr. Wagner presided over the recovered remains of the Challenger astronauts in both accidents. And he was part of an elite team selected to perform an autopsy on the President of the United States in the event of an assassination. "When I was hired in San Diego, I was told they wanted me to take the department in new directions," Dr. Wagner said. Seven months ago his vision culminated in the opening of the state-of-the-art Medical Examiner & Forensics Center on Overland Ave.
A lifelong dog lover, part of his plan was to recruit a shelter dog to become ME Canine 2, the second cadaver dog in his department. 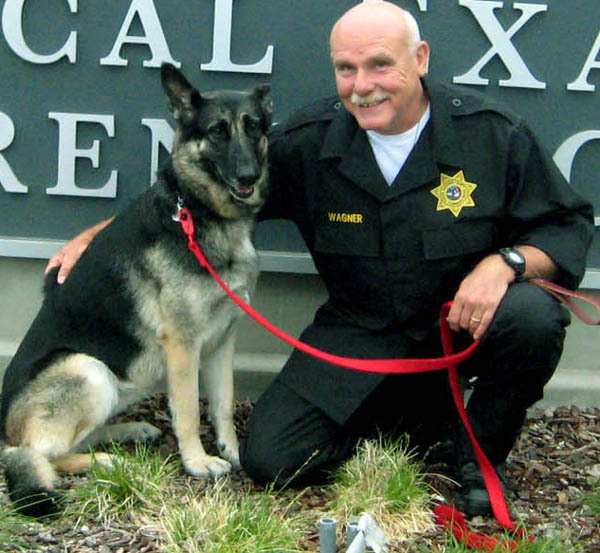 I was fortunate to land an exclusive interview with Dr. Wagner on the occasion of the debut of LuLu, ME Canine 2, a four-year-old German shepherd from the North Shelter in Carlsbad. This is the same shelter where Lara and Barney came from a year ago. LuLu once again proves that SHELTER DOGS ROCK! You can read LuLu's story in today's San Diego Union-Tribune. You can watch LuLu on her first day of work on YouTube. LuLu weighed in at 70 lbs. 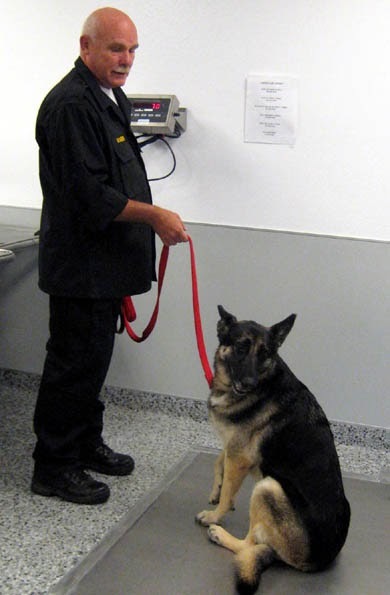 on the scales at the Medical Examiner's office her first day of work on Friday, July 9. LuLu will join Theila, a bloodhound also known as ME Canine 1, for 18 months of training in air sniffing, tracking and trailing as a cadaver dog. Although dogs have been known to develop depression in this line of work, especially in extreme circumstances such as 9/11, Dr. Wagner has a reward system in place to hopefully prevent this. When LuLu is not at work, she can be found chasing gophers and playing with Cocoa Bean, Wagner's 10-year-old Chesapeake Bay Retriever, on his four-acre property in Vista. Dr. Wagner's wife, Joan, is strengthening LuLu for her new job with home cooking and lots of TLC. LuLu's biggest challenge will be keeping up with Wagner. At 64, he says his own work ethic will most likely keep him on the job until he passes himself.
" I believe life is a transition and that we are obligated to have a positive influence," he said. "When everything is said and done we have an appointment with death. At that time we will look back and see footprints and know they are our own and that we made a difference."